I have enjoyed using Glimmar's Steampunk for my Minecraft world so much, that not having textures to go with his amazing textures needed to be rectified. I, Megistus, took it upon myself to change that situation, and as such my Mod Support Resource Pack was born about two years ago. Initially it was for my own personal use, but, decided that for all the work I was doing, that it would be great to share such a resource with the community. With special permission by Glimmar himself, he has allowed me to put my resource pack up on Curse to increase visibility of the mod support pack, but also to increase the visibility of his pack as well. Additionally, as I am able to upload to this site, and do versioning a lot more easily than trying to change Glimmar's Minecraft forum OP every time I do an update, my intent is to have not only to be able to download from this site, but also from the OP site that will automatically reflect when I have updated. However, the permission gained does have limitations. While you can read this below, it is worth stating here: While I do maintain the Mod Support Resource Pack ... all copyright for this pack belongs to Glimmar as many of the textures belong to him, or have been derived from other texture donations to him. All copyright that govern's Glimmar's pack also govern this pack as well. It is his property, and will be treated as such. I just maintain this particular support pack. 1. I only update mod textures for mods that I use. In this pack there is a number of new textures - usually tweaked from Glim's original textures so that many of the mods will seamlessly fit into the textured world created by Glimmar. If you are desperately wanting to have your favorite mod textured, feel free to look through all the work here and take a crack at mod texturing yourself. 2. Because of the 1.7+ Resource Pack architecture, the mod textures are their own resource pack. However, you will need Glimmar's resource pack for this pack to work correctly. 3. Because of Forge Mod Loader now assigning ID numbers, there is a potential that some of the CTM work I have done for the mods may not function for you. You will have to manually seek out the ID numbers on your own and change the properties file name depending upon your configuration. 4. The specific work that I have completed can be found in the ChangeLog.txt. Changelogs found in the indvidual texture files are now depreciated. See this file for specific changes. Hopefully I have been diligent enough to document all the work. This resource pack(henceforth "textures" or "The resource pack"), is the sole property of the Mod author (Glimmar, henceforth "Owner" or "The Owner") or work by other authors by which material/textures are being used with consent. By default it may only be distributed by the author on minecraftforums.net, or other sites The Owner personally posts it on. Permission has been granted by the Owner for "Megistus' Mod Support Texture Pack" (henceforth "mod pack") to be distribued on Curse/Curse Forge (solely) separately from what the Owner posts on. Ownership of the mod pack resides with the Owner (Glimmar), and is maintained by Megistus. In the event of Glimmar's extended absence from the Minecraft Forums, Glimmar's Steampunk and Megistus' Mod Support Testure Pack remains copyright and the property of the Owner (Glimmar) according to the conditions laid out below. 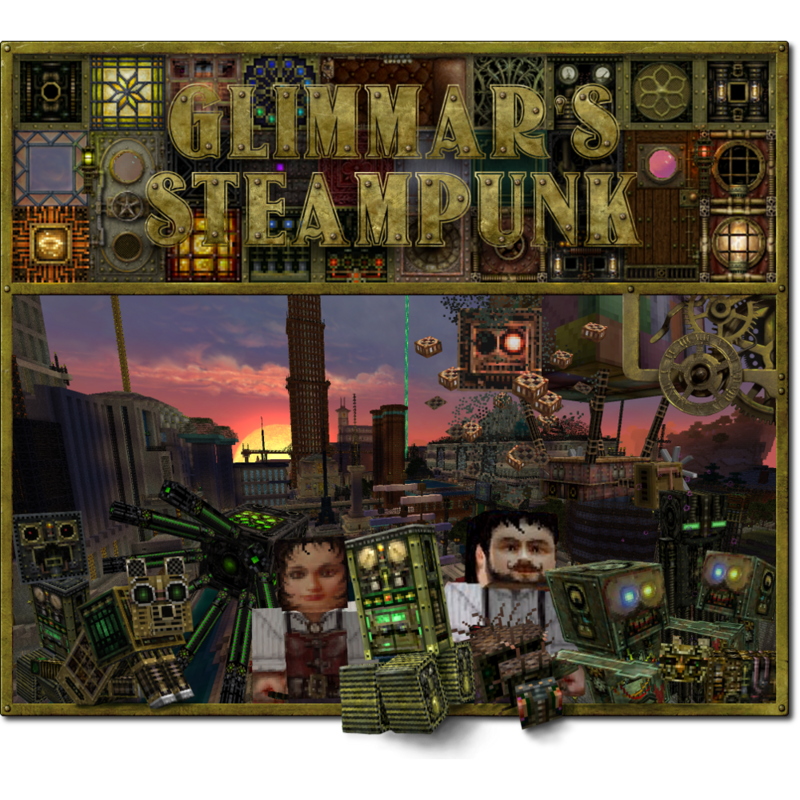 Any public distribution of the textures supplied within the 'Glimmar's Steampunk' resource pack and other downloadable Glimmar art assets, without Glimmar's written permission, is strictly forbidden. The Minecraft EULA does NOT supersede the Owner's International copyright, this licence or conditions herein. Gold version: A strict level of security. Having this on my pack indicates textures can only be used after written permission is obtained from the Owner of the pack (Glimmar). It also indicates that adfly links on downloads containing the Owner's work are never acceptable, under any circumstances. This Resource Pack is provided 'as is' with no warranties, implied or otherwise. The Owner of this resource pack takes no responsibility for any damages incurred from it's use. This resource pack alters fundamental parts of the Minecraft game and Minecraft may not work or may work differently than expected. All damages caused from the use or misuse of this texture pack fall on the user. For personal use you are free to modify the pack, but you must not redistribute such modifications or any part of this resource/texture pack online or by any other means. Create videos and post them here on the Minecraft Forums* or any other third party websites*. Please let Glimmar know so he has the chance to add them to his user media gallery in the offical thread. Link to Glimmar's Steampunk resource pack thread on the Minecraft Forums, so other Minecraft users can enjoy Glimmar's Steampunk. Upload any Glimmar's Steampunk resource pack files or textures to any third party servers, eg. Planetminecraft.com, etc. If you are using 'Glimmar's Steampunk' or the 'Mod Support' Resource Pack and you wish to modify some of my textures (for your server or adventure map), post a single download link to your add-on resource pack in the Owner's MC Forums Glimmar's Steampunk thread (ie. your add-on resource pack file must be hosted on my offical thread), to which all traffic for GS downloads must be directed from your own thread or website. This means The Owner gets fair recognition for his original work and your users always get the latest 'official' version of Glimmar's Steampunk, even if you don't update your add-on file. Clear and appropriate credit and a link to The Owner's Minecraft Forums 'Glimmar's Steampunk' resourcepack thread must be given at all times on your main public page (ie. not tucked away at the bottom of your thread or webpage!). There is a Glimmar's Steampunk 'link' banner on the first page of the official thread for this purpose...please use it. Modified versions of the Owner's resource pack or individual textures must not under any circumstances be offered for download on public Minecraft Websites. eg. Minecraft Forums, Planet Minecraft, etc. or anywhere outside the Owner's official download threads. Any contravention of this condition will be reported and Where necessary the Owner may claim damages and/or take other appropriate action to rectify the situation. Any modified versions of my textures remain the property of the Owner and are thus subject to the Owner's conditions above. Making supporting textures for mods, eg. Feed The Beast, Tekkit, etc. (but absolutely not other texture or resource packs) in the style of this pack, may be an exception to the above. Please see the Owner's 'Mod Suppport' section in my Mincraft Forums thread (link above) for licence conditions. If you aren't happy with any of the above conditions...tough! Don't bother using my textures or resource/texture pack, or even asking...couldn't be simpler! If this does get updated, I would recommend adding support for AbyssalCraft (as many, including myself, combine the Lovecraftian Horror genre with the Steampunk), Biomes o'Plenty, as it is one of the most commonly used mods there are, Quark and, as the other comments have suggested, the Immersive Engineering mod series, including the base mod, Immersive Petroleum, Immersive Tech, etc. And it would be awesome if you could add Botania support. magic mods, and the standard Botania textures are kind of boring. Please please please add support for Immersive engineering and Immersive petroleum. Those mods fit so perfectly into a steampunk world.